Tour Plan to Tenganan Ancient village with our English Speaking Driver. Good morning Mr John and Mrs John. I’m Gede and I will be your Bali driver for today, I’m happy to share about Bali and special today we will take you to Tenganan Ancient village. Now is 08.30 AM, we will need about 1,5 hours drive from Kuta to Tenganan. This village located near Candidasa village and having the unique culture and traditions, once we arrive there, we should pay for donation. What and Where Is Tenganan Village? 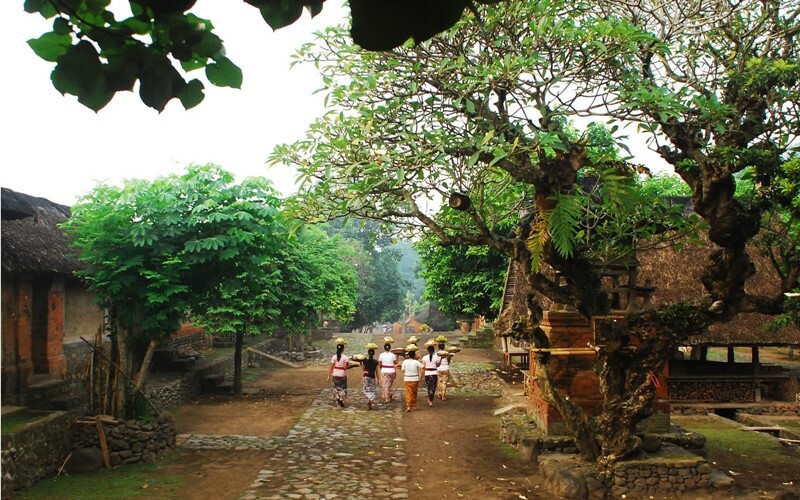 Tenganan Village, also known as Tenganan Pegeringsingan, is one of a number of ancient villages on the island of Bali. The pattern of life of the people reflects the culture and customs of the Bali Aga village (pre-Hindu) which is different from other villages in Bali. Therefore Tenganan Village was developed as one of the cultural tourism objects and attractions. The location of Tenganan Pegeringsingan Village is located in Manggis District, about 17 km from the city of Amlapura – the district capital -, 5 km from the tourism area of ​​Candidasa, and about 65 km from Denpasar City. As a cultural tourism object, Tenganan Village has many uniqueness and distinctiveness that are interesting to see and understand. From the community system that was developed, that the community of Tenganan Village consisted of indigenous people from the local village. This is because the marriage system adopted is a parental system where women and men in the family have the same degree and are entitled to be heirs. This is different from the familial system adopted by the people in Bali in general. In addition, they also adhere to an endogamy system where local people are bound in awig-awig (customary law) which requires marriage to be carried out with fellow Tenganan Village residents, because if it is violated then the residents are not allowed to become village krama (citizens), meaning that he must leave the Tenganan village. During that 1 month, Mekaré-karé takes place 2-4 times and every time it is held, offerings will be given to the ancestors. Mekaré-karé or “pandan war” is followed by men from the age of children to the elderly. As the name implies, the facilities used are pandan leaves which are cut to ± 30 cm long as weapons and shields which serve to fend off the opponent’s attack from the grind of pandanus thorns. Wounds caused by the grind of pandanus spines will be covered with antidotes made from herb tubers, such as laos, turmeric, and others. Mekaré-karé is essentially the same as the tabuh rah ceremony which is commonly performed by Hindus in Bali while holding religious ceremonies. In the Mekaré-karé ceremony, it is always accompanied by a typical port of Tenganan Village, the selonding gamelan. Another uniqueness possessed by Tenganan Village which is not owned by other regions in Bali even in Indonesia is the craft of double weaving of Gringsing cloth. The word Gringsing itself comes from the word “gering” which means sick or calamity, and “sing” which means no, then overall gringsing is interpreted as repellent. That is the story about Tenganan village. Where else can we stop when we go to Tenganan? Other stop we may do on the way to Tenganan, we have Kertha Gosa, the royal court of justice which located in the heart of Klungkung city town with museum Semarajaya in the complex of the Kertha Gosa. Taman Gili Park Kerta Gosa in Klungkung Bali was built in 1686 by the first king of the Klungkung Kingdom, Ida I Dewa Agung Jambe. As one of the relics of the Klungkung kingdom, Gili Kerta Gosa Park or better known by the name Kerta Gosa, has its own uniqueness which is an open building (bale) which is officially part of the Puri Semarapura complex. Gili Kerta Gosa Park consists of two buildings, namely Bale Kerta Gosa and Bale Kambang. 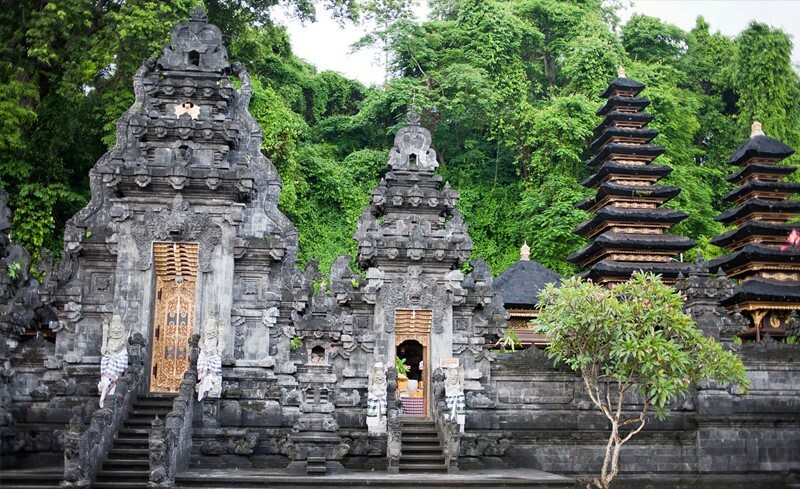 The two buildings are characterized by very thick traditional Balinese architecture. The uniqueness of the two buildings is on the ceiling decorated with traditional Balinese paintings of Kamasan style. Initially this painting was made of cloth and parba. In 1930, the ceiling was replaced, then the original painting was restored. Bale Kerta Gosa serves as a traditional court place led by the king as the highest judge. This function is closely related to the story displayed on the paintings on the ceiling of the building, namely the story of Tantri from the book Swargarokanaparwa, and the story of Bima Swarga with the theme of the punishment of karma phala (a result of the merits of human actions). From Kuta take about 1,5 hours drive to reach Kerta Gosa. After This, we will drive another five minutes and may stop at Tukad Unda. The Tukad Unda Waterfall tour at Semarapura Klungkung is one of the tourist attractions in Unduk Yeh Tukad, Semarapura Kelod Kangin Village, Karangasem District, Klungkung Regency, Bali, Indonesia. The Tukad Unda Waterfall tour at Semarapura Klungkung is a tourist spot that is crowded with local tourists on weekdays and holidays. This place is very beautiful and can give a different sensation to our visit after spend long week working. Tukad Unda Waterfall Tourism in Semarapura Klungkung has a very interesting beauty to visit. It’s a pity if you are in the city of Klungkung not visiting the Tukad Unda Waterfall Tour in Semarapura Klungkung which has such an unparalleled beauty. The view can see from Unda Bridge, to see closer and walk down to the waterfall, we have driver further and take turn left to get walk down to Unda river, its nice spot for photo, selfie and just bath your foot and feel the sound of the river nature . From here, we will drive further east, about 20 minutes, we will be at Goa Lawah temple / Bat Cave Temple, this object is located near Goa Lawah black sandy beach, This is one of the public Temple which is full of pilgrimer come to worship, for Hindu in Bali, after the cremation ceremony, we have another Ngeroras ceremony where the symbol of our Ancestors will take to praying at Goa Lawah Temple and Besakih Temple as the part of Nyegara Gunung ceremony. Gunung is Mountain Temple at Besakih, Nyegara is Temple of the Sea in Goa Lawah. The unique one of this Temple is inhabited by hundreds of bats hanging around the mouth of the cave and we are believe that that cave are connecting to Mount Agung, and also the cave are protect by the holy snake. Well that is a little bit about the trip for today, if you have any question, please feel to ask me and also if want make stop on our trip, we are very happy to give you time for photo.